This is the time of year where wallets are usually at their thinnest, so we totally understand it if you don’t have the funds to go out and purchase expensive ornaments, lavishly decorated garlands, high-end dinnerware, AND gifts for everyone attending your gatherings. We love getting to come up with creative ways to deck the halls without breaking the bank, so if you would like to hear some of our tips, read on! Even if you’ve already decorated, these six ideas may be something to think about next year or may even be the perfect post to share with a friend in need of some affordable Christmas spirit. Tip #1: Bring the Winter Wonderland IN! We are blessed to be living in an area where Christmas greenery is all around us. Go outside (where it is legal) and find some branches from an evergreen or some twigs from a holly or cranberry bush. You won’t believe how elegant a simple handful of winter greens will look when placed in a large vessel. There is a reason why real trees are such a huge hit with families. There’s something about going to a farm, a store, or (even better) your own property and choosing your favorite trees to bring home. The good news for us citizens of Poplar Bluff and surrounding areas is that we also have the opportunity to not only buy fresh trees, but fresh wreaths and garlands, as well. Not only is it much cheaper to purchase than artificial greens, but it gives you that natural, whispy look and enchanting smell that can’t be matched. I love to hang wreaths from windows (with the decorations from tip #3) for that classic, storybook Christmas style. Whether they are electric bulb candlesticks or old taper candles you have lying around, put a single candle in each window (or a three-part candlestick in large windows). This is a great tip if you don’t want to spend a ton of money and time stringing lights up on the exterior of your home. Candles can be as equally beautiful and enticing on their own. They create an intimate, cozy feel as if you would walk in the house and find everyone snuggled in blankets around the fireplace. P.S. Candles in general are always an inexpensive way to create an amazing atmosphere. Just make sure not to put scented candles on your dining table, as they will distract from the lovely smells of the Christmas feast! Christmas is the best time of year for nostalgia! In many cities and large towns, vintage stores like to mark up their prices because people will pay good money for good vintage. But US? We keep our prices very reasonable! We have some of the cutest vintage Christmas decor at great prices! Antique toys? We’ve got ’em! Vintage Santa dolls? We’ve got those, too! Charming miniature villages? You bet! And, our home decor and Christmas decor is also on sale! An easy and affordable way to festively decorate your home is by using something so versatile and cheap- wrapping paper! Whether it’s large boxes wrapped in coordinating packaging or an entire wall covered in your favorite Christmas pattern, it won’t cost you much! There are plenty of ideas online for using paper as decoration, so get busy lookin’! A wonderful trend has been popping up for a few years now- incorporating your year-round decor in your Christmas decorating. If you’ve got glass hurricanes, apothecary jars, or cloches (bell jars), put them to use! Fill jars with bulk ornaments or pine cones for a super easy centerpiece or create a miniature Christmas scene in a glass container with snow, bottle brush trees, and small woodland creatures. You can also put random home decor items in your Christmas trees. We decorated a tree here at the store using only ribbon and our collection of antique silver dinnerware and candlesticks and it is so adorable! It’s the MOST WONDERFUL TIME of the year! Let’s get to rockin’ around the Christmas tree and decking the halls with… okay, I will stop with the cyber caroling for those of you who are “already tired of Christmas”. But seriously, it is the best time of the year! I know that people get crazy and schedules get hectic and bank accounts get low, but let’s focus on what makes this season so fantastic! Surely there are people you care about in this world, so make this Christmas about that- not about how many crowds of people you have to wade through to get that cheaply-made television that will break in six months or how many games of Dirty Santa you have to buy gifts for. This Christmas is going to be great as long as you focus on the important things and take the time to enjoy them! So, if you are now in the Christmas spirit, let’s talk about one of my most favorite Christmas past times- decorating, of course! For me, the Christmas season doesn’t start until the trees are up! In fact, I’d have a bluuuuuue Christmas without them. Okay, I am seriously stopping this time! We held our first EVER Christmas open house on November 8 and, though we were exhausted, it was a blast preparing the store with all of our fun items. One thing I always try to do when Christmas decorating is think outside of the box. As cliche as this phrase is for people in the decorating business, this is something that will really take any holiday prepping up a notch! Ok, let’s start with fluffing! At ReBlessed, Sondra and I are very picky about how our trees are fluffed. You can have one whimpy looking tree if you aren’t properly fluffing it. Click here to view some great tips on fluffing your artificial tree. In the world of interior design, lighting is KEY! You can have the most beautifully decorated room but if you have atrocious lighting, it will really put a damper on the mood and will spoil the design. I look at trees the same way I look at decorating a room. Start with good lighting! Now, I know that they don’t make florescent Christmas lights, thank God! Most Christmas lights always cast a soft, warm glow. However, when purchasing lights for your holiday decorating, think about your style! Lights come in all shades and colors. If you want something whimsical and fun or just miss the nostalgia of traditional Christmas trees, colored lights are great! They complement sentimental or hand-made ornaments and give that vintage vibe. For a more classier or modern look, white lights are beautiful! Here’s the thing you need to know, though. The new LED lights come in warm white or cool white. Like lighting in a room, they both create different moods and looks. The warm white is more, well, warm. The blue light can be a little more harsh, but if used well it can be quite magical. If you are doing a gorgeous, elegant tree with classy ornaments, you may not want to go with the blue-tinted cool white lights, unless your theme is like a frosted wonderland with lots of silvers, whites, and blues. With that being said, lets move on to bulbs. For the past two years, I have been lighting my tree this way and I don’t know why I didn’t think of it sooner! Of course, when lighting your tree, always wrap the small lights around the branches going in and out of each branch. Never wrap the small lights around the tree candy cane style. The café bulbs can be wrapped candy cane style, though, just hide the excess cords by tucking them inside the tree and covering them with spare branches. A really great thing about the café string lights is that they usually have little clips at the base of each bulb which allows you to position the lights perfectly. Always make sure the bulbs are facing outwards and, like all tree decorations, are evenly spaced. You can also use two colors (like red and white) or twinkle lights to make the lighting special! One rule of thumb I always use when decorating your tree is to start with the items that will cover most of the surface area. Once your tree is lit, the first thing you will want to put on the tree is anything you will have to wrap around it or drape from it like garlands, ribbons, or beads. The next step is placing the larger filler items. After I wrapped this tree with ribbon, I then filled it in with the burgundy leaf picks and books. When decorating with picks, always make sure you fluff them out first so they are full and facing forward. To keep the picks from sticking out like a sore thumb, just shape the picks to the curve of the tree. This is where the real creativity comes in! When decorating trees, think outside of the traditional ribbons and ornaments. You can fill a tree with so much more! You can use anything from picture frames, chalkboards, figurines, antlers, small lanterns, giant pinecones, and many other light-weight decor items. This technique works wonders for more imperfect trees that are a little bare in spots or have missing branches. To be cautious, always make sure heavier items are nesting on the main branches of the tree and wrap the longer extended branches around the corners to hold it into place. Also, do a shake test to make sure it won’t eventually come tumbling down the tree. This tree has been one of my favorites! I was inspired to do this theme once we ordered those clock ornaments. 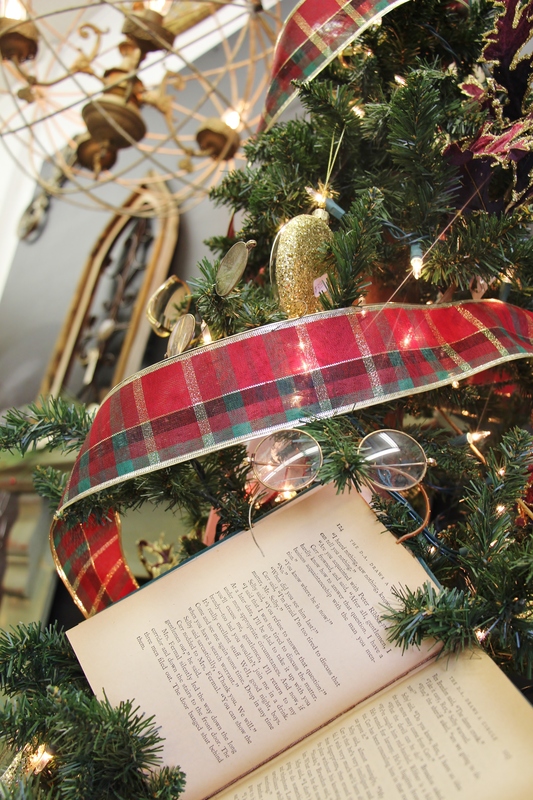 I then spotted some gorgeous tartan plaid ribbon and Sondra’s collection of vintage spectacles and just had to do a traditional, masculine tree. When choosing where to place your trimmings, always place your most important items where they can be seen. On my trees, I always put my favorite items somewhere around eye-level. If it is a really large item, like a set of antlers or a lantern, then put it somewhere close to the bottom of the tree where it is thicker. One exciting thing about using the café bulbs is that they give you areas to really highlight specialty items. I often place some of my prettiest ornaments and decorations where the lights from the large bulbs will light them up! Keep in mind that those bulbs can heat up, though, so you may want to ensure that nothing is directly touching them. That’s all I can think of. The rest is just up to you! Now get to filling those trees and enjoying time with your loved ones!